I try to go to writing classes when I can because I always leave with some new tools and a better understanding of my old tools. At the end of June I got to attend the two-day writers workshop hosted by the Locus Awards about creating character, plot, and scenes. It was taught by Daryl Gregory the first day and Connie Willis the second day. Both halves of the workshop were all kinds of awesome. Both Connie Willis and Daryl Gregory are fabulous teachers. I just finished typing up my hastily scribbled notes from the class. I’m not going to share everything (that would be a very long post), but I will share a couple ideas that particularly generated ah-ha moments for me. New-ish writers like me hear this over and over again – the story must start as close to the inciting incident (point where everything changes) as possible. Thou must not start with a bunch of backstory to set the scene. But even when I start in the middle of the action it’s hard to figure out exactly where to start and how to give the reader enough information to understand what’s going on. I feel like I understand what this means a little better. The purpose of an opening scene is to hook my reader. My reader should want to learn more. My opening should raise questions in the reader’s mind to get them to keep reading. My story beginning should make the reader care about my character, so they care about whether or not the character gets what s/he wants. Once my reader is hooked, then they will care about the character’s backstory and anything else they need to know to understand the rest of the story. Dialog is way more than just two characters chatting. It can and should be used for all kinds of heavy lifting to reveal plot and character. It never hurts to remind myself that characters should always want something. In dialog, the information conveyed by a character should move them toward their goal. Every speaking character wants something from the other character. When I look at my gigantic to-read pile, it’s hard to pick up an old favorite. I knew that reading favorite books and re-watching favorite films or TV shows – paying attention to everything that works and doesn’t work, and figure out why – would be educational. But I haven’t done it much. So right now I’m re-reading “Druss” by David Gemmell, one of my all-time favorite heroic fantasy novels. 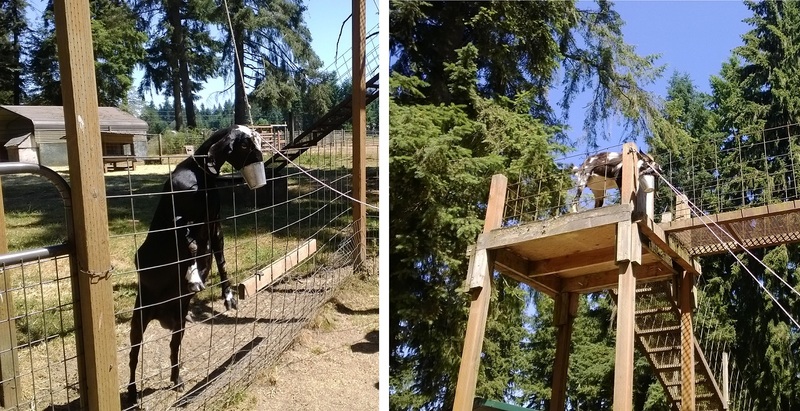 These goats have learned to use this pulley system to pull the little bucket toward them and eat out of it. Have you been to a good writing workshop lately? This entry was posted in Writing Path and tagged heroic fiction, writing, writing workshop. Bookmark the permalink.